Reblog: Apparently This Matters: iPotty – EXPLORE . ADVENTURE . DISCOVER . Behold, the iPotty. Yep, it's pretty much what you think it is. (CNN) — I have a dog. A dog who, as I write this, is curled up quietly on the sofa, probably dreaming about dog things: Chasing squirrels. Riding in the car. His fake doggy girlfriend in California whom he’s never actually met. And, just like every other night, before we go to bed, I’ll open up the back door so he can prance out into the yard to drop a toaster-sized stinker on my lawn. Which I’ll promptly pick up some time next month. Maybe. This entire routine required a learning curve that took all of about a week when he was just a puppy. But some of my friends have kids. Kids who, as I write this, are likely not curled up quietly on the sofa, dreaming about kid things. “Apparently This Matters” Is Jarrett Bellini’s weekly (and somewhat random) look at social-media trends. Because they’re wildly romping around the living room, pooping in their pants. And, at least to me, this constant cleaning and changing of said pants seems far more gross and burdensome than occasionally stepping outside with a Kroger grocery bag firmly wrapped around my hand. There’s no right answer here. I’m just a little unnecessarily kid-phobic. They’re expensive, they tell boring stories, and most of them require guidance and understanding. Mikey just wants a rawhide. But, back to my original point, training my dog to go outside only took a matter of days. Whereas teaching children to properly use the bathroom literally takes years! However, there’s a new product soon to be on the market that might just make the baby-vs.-toilet experience a little easier, if not completely ridiculous. It’s called the iPotty. Because, if there’s one alphabet letter that needs to be prison-shanked and dropped into a shallow grave it’s the lowercase i. That, and the capital R. Don’t ask. It’s personal. For $40 you get a fairly normal-looking, plastic, child-sized toilet with a removable bowl. Which is great for potlucks. But the iPotty also has an adjustable stand specifically made for mounting an iPad so your child can play games and watch videos while learning to make iDoody. The creator of this product, CTA Digital, recently debuted the iPotty at the Consumer Electronics Show in Las Vegas, and it’s become a popular story on several different websites, primarily because we now have a strong candidate for the most reckless idea ever. But never mind the fact that most people probably don’t want their iPad within 30 feet of a child, much less one who’s learning to drop a deuce. Kids probably don’t need this much stimulation. Especially on the toilet. Mind you, I do. But I’m an adult. And it’s gonna be a while. Alas, the primary goal of mounting an iPad within the iPotty is simply to get your kid to actually spend more time on the toilet learning how to properly go. And, perhaps to some parents, if utilizing technology works, so be it. The ends justify the means. All hail the iPotty! Still, what if this ultimately leads to some weird social conditioning where, even as the child gets older, he simply can’t do his business without having expensive electronics right there in front of him — a serious mental crutch. Sort of like Morgan Freeman’s character, Red, from “The Shawshank Redemption,” who, after being released from prison, famously couldn’t “squeeze a drop” without asking permission. 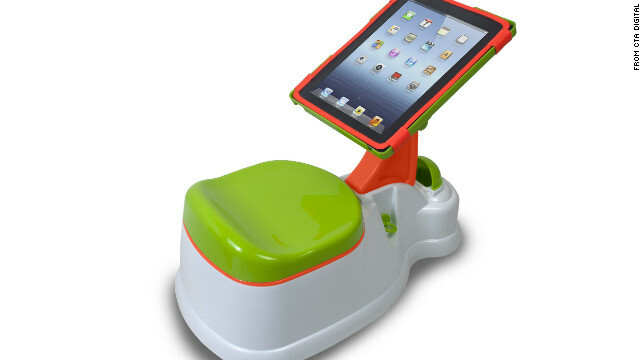 With the iPotty, a kid gets socially conditioned to hold something shiny with a lithium battery to go to the bathroom. Which could some day turn ugly. Other critics of the iPotty have argued that toilet training is an important bonding moment between a parent and his or her child — that introducing games and movies diminishes the experience. I’d argue feces diminishes the experience. But if you want to blame “Angry Birds,” go right ahead. All in all, it’s just sort of a silly idea, bribing children to use the toilet with the promise of touchscreen entertainment, perpetuating this need for visual stimulation literally all the time. But, on the other hand, we all do it. Whether it’s an iPhone at work or a copy of Sports Illustrated at home, let he who is without a magazine in his bathroom cast the first stone. I honestly don’t care. I have a dog. And Mikey just wants a rawhide.